To Ensure that in future National differences shall be settled by some other means than war. To demand that women shall have a direct voice in the affairs of the nation. - The Women's International League (Wellington Branch) States its Objects, August 1916. The Women's International League for Peace and Freedom (WILPF) is the oldest women's peace organisation in the world. 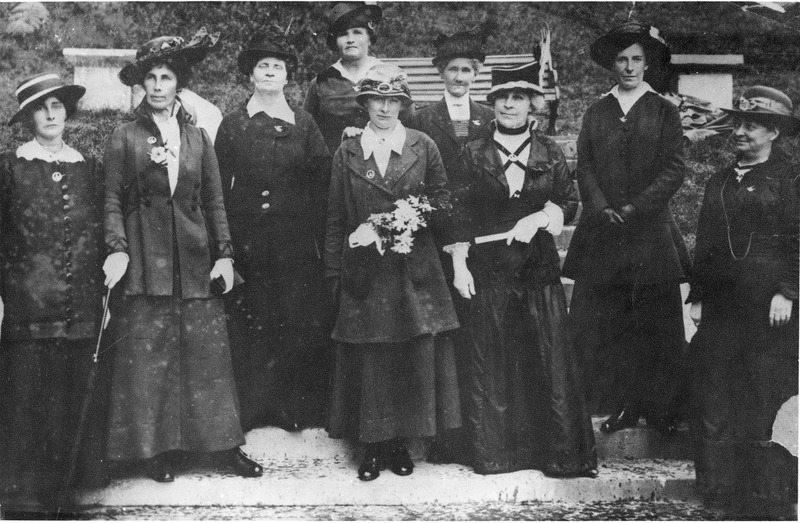 A branch of the league was meeting in Auckland by April 1916, and when Adela Pankhurst visited Auckland in May1916 a photograph was taken of her with a group of women, four of whom are clearly wearing the badges of the Women's International Peace League. The Wellington branch was established by August 1916, when a statement of its objects was published in the Maoriland Worker and a branch had been established in Christchurch by October 1916 when a meeting was held in the Socialist Hall. Early statements of objectives show that the league aimed to unite women around the world in a common cause of political equality for women, and peace and justice for all. It was first established as the 'International Committee of Women for Permanent Peace' at the congress of women meeting at the Hague in April 1915, and went through several name changes in its early years before settling on The Women's International League for Peace and Freedom. In 1915 and 1916 the League wrote to several Christchurch women including members of the Canterbury Women's Institute - Kate Sheppard, Christina Henderson, Ellen Vickers Howell, and Ada Wells - and also Dr Jessie Scott, of Brookside, Canterbury. The league hoped that at least one of them would take the lead in establishing a New Zealand branch, though their letters were not immediately effective. Membership included Mrs Cooke, Mrs Ingram, Mrs Scapins, Mrs Jackson, Mrs Fisher, Mrs Frantovitch and Mrs Hannam, with Jessie Savage and later Annie Gadd as secretary and Mary Mathieson, (Matherson) as President. In 1918 the league opened a fund to assist conscientious objectors and also planned to organise transport for family members wanting to visit conscientious objectors at Paparua. Reference is also made to the WIL having 'weekly meetings' one of which was addressed by Councillor Ada Wells who spoke about conscientious objectors and the recent court martial of three men in Christchurch. A branch of the WIL was established in Auckland by April 1916 and amalgamated with the Auckland Women's Political League in 1918. Together they operated from 1919 as the New Zealand section of the Women's International League for Peace and Freedom (WILPF). In 1925 they became the Auckland Women's Branch of the New Zealand Labour Party. WILPF re-emerged in Auckland in 1930 after the New Zealand Labour Party had abandoned its anti-militarist and anti-conscription stance. Emily Gibson and Mrs Darcy Hamilton restarted the WILPF because New Zealand Labour 'no longer stood for world peace'. At this time it was active only in Auckland. With an international conference on disarmament coming up in Geneva in 1932 WILPF organised a nation-wide petition urging multilateral and unconditional disarmament, which was picked up by churches and peace groups around the country. Under the leadership of Lincoln Efford, a World Disarmament Petition Committee collected a total of 17,650 signatures in Christchurch, more than in any other centre in New Zealand. During the few years that the Women's International League was active in Christchurch there is some evidence that its leaders were connected with the trade unions. Perhaps its members decided their greater loyalties were with the labour movement, as the league in Christchurch seems to have lapsed by the early 1920s. A branch of WILPF in Christchurch was revived in 1999 by Mia Tay and Kate Dewes, though individuals in Canterbury had been members of WILPF for many years before this. 'Wellington Branch', Maoriland Worker, 2 August 1916, p.3. ‘Women’s International League’, Maoriland Worker, 26 April 1916, p.3; Betty Holt, Women for Peace and Freedom, (Wellington: WILPF, 1985), p.12. 'The Women's International League states its Objects', Maoriland Worker, 2 August 1916, p.3. 'Women's International League: Christchurch Branch', Maoriland Worker, 18 October 1916, p.3. WILPF Series III, Folders 11-13, 1915-25, Archives and Special Collections, University of Colorado, Boulder. They also wrote to Charles Mackie and Mr J.K. Worrall of Tancred, Street in Linwood, but the date is indistinct. 'Christchurch Branch of the Women's International League Extend Hearty Christmas Greetings', Maoriland Worker,12 December 1917, p.11. The message was signed by Mrs M. Matherson, President and Mrs A. Gadd, Secretary, C/o Trades Hall, Christchurch. 'Christchurch Court', Maoriland Worker, 13 June 1917, p.5; ‘Charitable Aid: Administration Committee', Maoriland Worker, 11 October 1917, p.2; Letters to Mackie from members of the Women's International League, Mackie Papers, Series 588, Box 16, Folder 61, Canterbury Museum, Christchurch. ‘Jailed Objectors: Assistance for Dependants’, Maoriland Worker, 16 January 1918, p.7; ‘Women’s International League: Christchurch Branch’, Maoriland Worker, 20 March 1918, p.7; ‘Women's International League: Christchurch Branch’, Maoriland Worker, 27 March 1918, p.7. ‘Women’s International League’, Maoriland Worker, 26 April 1916, p.3; Megan Hutching, 'Women's International League for Peace and Freedom 1916 '; Raewyn Dalziel, 'Auckland Women's Political League', in Women Together, ed. Anne Else, (Wellington: Historical Branch Department of Internal Affairs and Daphne Brassell Associates, 1993), pp. 80, 85. David Grant A Question of Faith: A history of the New Zealand Christian Pacifist Society, (Wellington: Philip Garside, 2004), p. 13. Grant, A Question of Faith, p.14. Letters to Mackie from Gadd, 19 January and 29 April 1918, come from the Trades Hall. Gadd to Mackie, Mackie Papers, Series 588, Box 16, Folder 61 and Series 45,Box 6, Folder 25, Canterbury Museum, Christchurch. In July 1917 they organised a meeting to discuss furthering the interests of the Maoriland Worker. Mathieson to Mackie, 12 July 1917, Mackie Papers, Series 588, Box 16, Folder 61, Canterbury Museum, Christchurch.